Whilst Governments focus is on protecting residential properties Floodguards realises that commercial properties need similar levels of protection for business continuity during floods and in the immediate aftermath. Commercial properties are just as likely to be built in areas that flood as residential properties. Commercial property and business owners suffer just as much stress and hardship as residential property owners in times of flood, so protecting your commercial property or business with Floodguards products can offer just as much peace of mind and protection as we do for residential property owners and occupiers. Floodguards has a three stream system to help protect commercial properties. The services we offer are grouped into short term solutions, medium term solutions and long term solutions. These can be viewed as quicker fix solutions that address an immediate concern about flooding for a particular building. These are measures that can be taken immediately to help mitigate concerns about the short term and would include the following measures: installing floodguards to door openings and also protecting the airbricks, installing Non Return Valves to sewage waste pipes to prevent the ingress of water via the drainage systems of your building. Applying a water proofing agent to exterior brick work, to prevent water entering the building through the brick work, sealing cable entry points, using internal or external tanking methods to prevent water entering through low lying rooms within the property. With the use of structural engineering we can help to prevent damage from flood water. All of these options can be used in the short term to protect a building that experiences infrequent low intensity flooding. handling system, which enables quick and easy deployment. The handling system allows up to 150m of flood protection barrier to be rolled out at any one time without the need for excessive man power or unrealistic storage requirements. The Rapidam can be combined with any number of other solutions we offer, including floodguards and airbrick covers, Sump and Pump, Sustainable Drainage Systems (SUDS), Compensatory schemes, Non Return Valves, Porous Surfacing, Defensive Walls, Earth Embankments, Rain Water Harvesting and Hydrological Modelling to implement the solutions in the most effective manner. Long term solutions consist of Floodguards offering advice on the two options open to you when a building’s integrity is just not sustainable in a real flood condition. This may be because the depth of water is just too great, the intensity of the flow of flood water cannot be contained or the building floods on just too many occasions. The options are to elevate key machinery or storage systems or to relocate the business away from areas that flood. 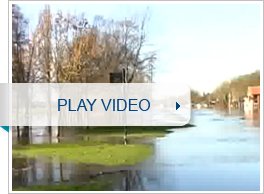 Floodguards can give advice on how to implement these options. In short, by working with our Floodguards’ competent staff and our network of installers we can protect almost any commercial property that is vulnerable to flood. We can protect entire sites using a combination of all of the techniques above and can point to protecting some very high profile commercial properties and sites around the world including, Tesco Supermarkets, Walmart, the worlds largest retailer’s distribution head quarters in America, various government and ministry of defence sites in the UK, and one of the largest whiskey distillerys in scotland amongst many other high profile sites.